I have a laptop on a shelf in my office that monitors several cameras that are around the outside of my house. They alert me to deliveries and visitors. While I can use a web browser to see their images it is easier to just glance at the screen on the laptop from time-to-time to see what's up. Unfortunately the laptop's screen saver cuts in after 30 minutes and blanks the screen. That forces me to get off of my chair and press the spacebar or shift key to bring the screen back. 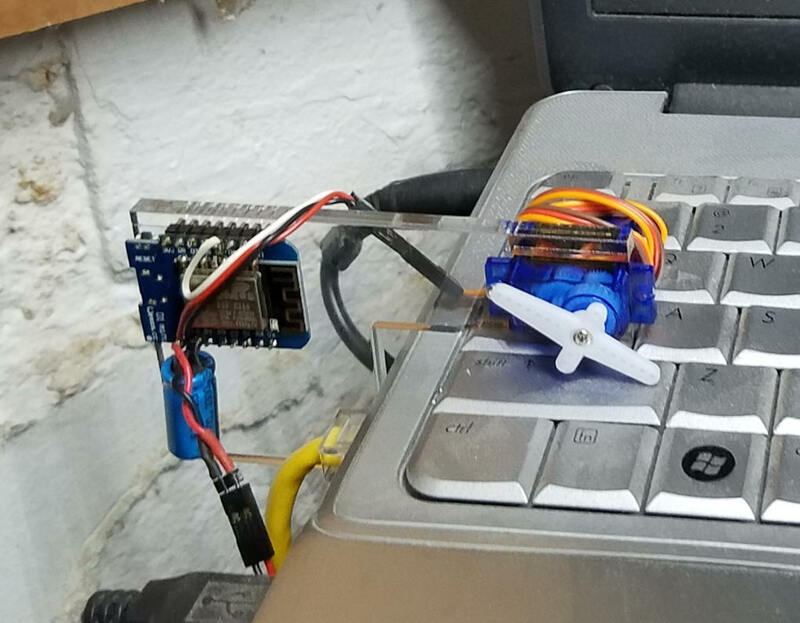 Having a voice activated Alexa controlled "finger" that could touch a key on the keyboard is surely not the simplest solution but it sounded like a fun project. This servo device places a movable arm just above a key on the keyboard. The statement "Alexa turn on keyboard" cycles the servo arm, pressing down on the shift key & renewing the screen - nice! 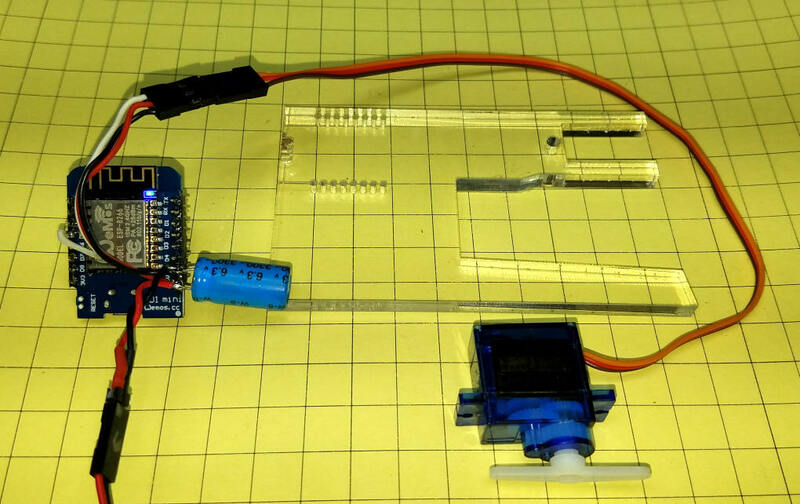 The application presented here is just one way that the servo can be used. Other applications include throwing a wall switch that turns lights on/off or moving some other device, perhaps a latch on a door or cabinet. If you come up with other applications please drop me an email and let me know (dave@davebodnar.com). Wemos D1 - from BangGood and Amazon. The "clamp" that holds it all together is shown here. The servo goes in the upper right and the Wemos goes into the holes to the left. The large tapered slot holds it to the side of the laptop. You will need to be changed the dimensions of that slot to fit your laptop. Click here to download a PDF or CorelDraw version of this clamp. The sixteen small holes for the Wemos are not electrically connected to anything - the are just there to help hold the controller in place. The parts that I used are listed above and shown here. All of the connections are made by soldering right to the Wemos D1. The capacitor and 5 volt power connecting go to the 5v and G pins. The servo also connects to these pins for power. The servo's data line (the white wire in this photo) goes to pin D5. Those are the only connections that are needed. Power can be supplied from an external 5 volt power supply or, as in this case, by a USB cable plugged into the laptop. The 3300 uf capacitor was added when the Wemos crashed periodically, probably due to variations in the supply voltage. Since the cap was added the unit has been very stable. Other electrolytic caps of 1000 uf or more should work. Here the Wemos & servo are mounted and the acrylic clamp has been placed on the keyboard. After programming with the code below (be sure to change the SSID and password to match your system) I told Alexa to discover devices. In a minute or so she reported that she had found a new device called keyboard. 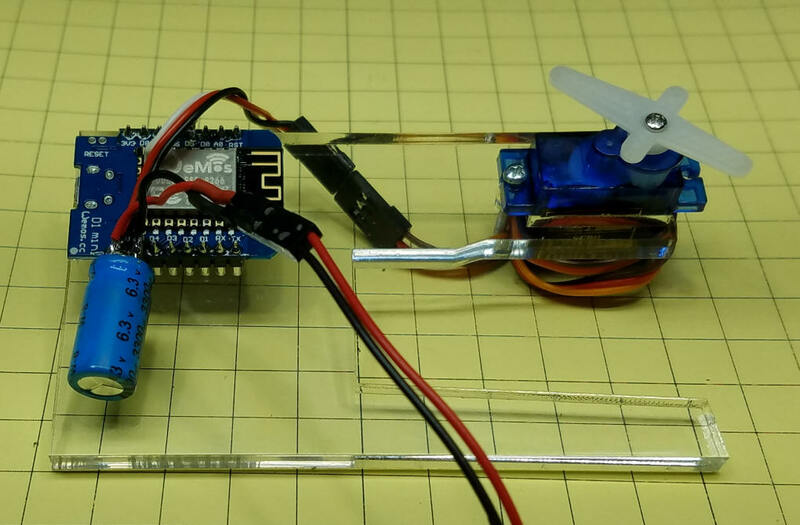 Once that is set the servo can be activated by saying "Alexa turn on keyboard" - note that there is no need to say "Alexa turn OFF keyboard" as the servo arm returns to the off position after pressing a key. The core code is below - you need to download this ZIP file to get the other tabs that are needed. to change the word "keyboard" to your word in a number of places. using the search and replace function (edit / find). 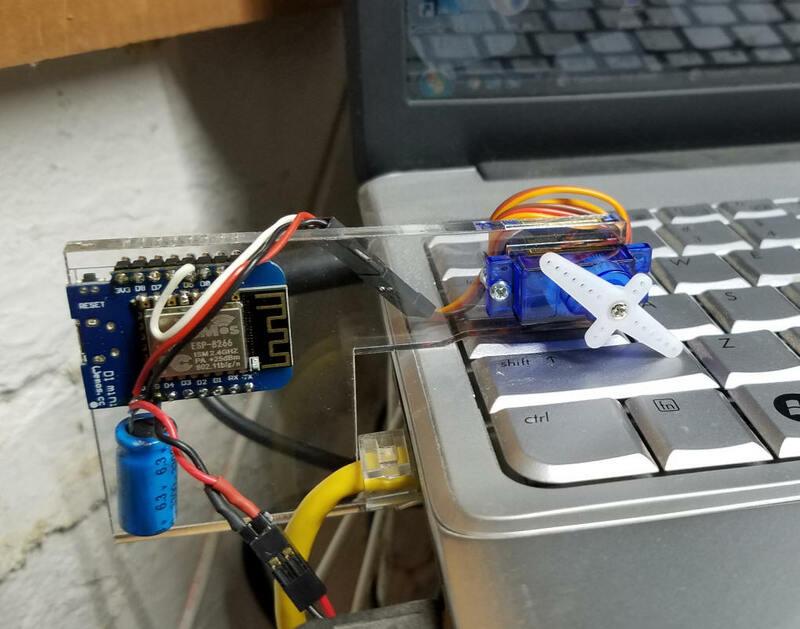 The code includes a routine that blinks the on-board LED on the Wemos every second. This was added to give the controller a "heart beat" during testing. If you find it unnecessary or distracting  it can be deleted. They are at the top of the listing in the "#include" statements.